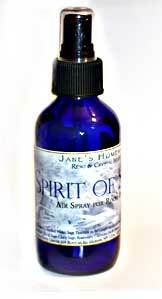 This delightful woodsy air spray can be used in your environment or on your body. It can be used as deoderant if desired, as sage is an excellent herb used to allay perspiration. It is a blend of essential oils in distilled water, with the addition of sage tincture in biodynamic grape alcohol, witch hazel and flower essences. It is made with essential oils of Sage, Clary Sage, Rosemary, Lavender, Fir and Cedar Tree Oils. The scent is clean and redolent of an afternoon in a sun drenched woods. Sage is a traditional herb used by Native Americans to 'smudge' themselves and their spaces, with properties helpful in clearing negative energies and stagnant energies. It can also be used in a sickroom, to impart healing, clearing, and cleansing energies. It is a wonderful way to literally clear the air of tension, unwanted energies or 'bad vibes' at any time. This recipe also incorporates crystal & flower essence infusions as important ingredients. The batch is made small, shaken daily for several weeks as the blend 'marinates'. The flower essences used are self heal, to encourage healing & space in which you can practice self care; crab apple for cleansing & to be relieved of physical impediments to metaphysical growth, rosemary to clear space for being present to our lives, and mimulus to clear space in which to grow in courage & to allow the possibility for the new to come in to our lives. A great way to clear the air, both within and without! I recommend using sage to cleanse a new space, such as a new home, car or office. It is helpful to change and charge the atmosphere before beginning any important work, meeting new people or simply going about your day. Try this spray and see how it lifts your mood! Because of the richness of the pure essential oils used, I ask that you shake before each use. Also, keep in mind, that when the bottle is emptied, you could fill it again, with water, and there would probably be enough residue of the essential oil left in the bottle and the sprayer, that you could get more scented spray out of the bottle. All of my sprays are infused with crystal and prayer energies, they are Reiki attuned and charged, and are always made with love. This batch was infused with the energy of phenacite and vera cruz amethyst for extra energy connected to the Divine! Make sure you shake the bottle before each use and once it's empty, just fill it up with more water to refresh the spray and shake well, you should be able to get another bottle's worth out of this! Note: Weight above is shipping weight. Actual weight is 4 fluid oz. Pregnant women, please check with your health care provider before using these products. None of these statements have been evaluated by the FDA. Please do not use this in place of proper medical care. Please make informed health choices.